Historical sword-combat instructor Devon Boorman was asked to give an inspirational talk at a TED Conference. His presentation drew upon the historical values of confidence, prowess, and humility – ideals of the code of chivalry! In this conversation, he describes the process of bringing historical ideals of honor to the TED stage. TED Talks are all the rage today – luminaries of all sorts have appeared on stage at “technology, entertainment, and design conferences” held all around the world, including Bill Clinton, Filmmaker James Cameron, Rev. Billy Graham, Stephen Hawking, Malcolm Gladwell, Julian Assange, and Bill Gates – all to present their talks, focusing on their own fields of expertise as a means of sharing their passion, their vision, and their inspiration – in 18 minutes or less! In fact, it might be said that no trend, no fashion, no movement can really “hit it big” today until it’s been presented in a TED Talk. But in all the archives of more than 30,000 live presentations (with the marginal exception of one about conquering fear and the art of sword-swallowing) only a single TED Talk involves sword work on stage, and that was presented at the 2016 Vancouver TED-X Conference, and was given by Devon Boorman. 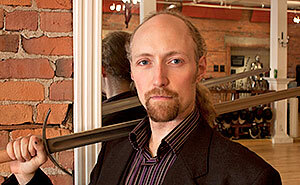 Mr. Boorman is the co-founder and director of Vancouver’s Academie Duello, and has studied and taught medieval and Renaissance martial arts all over the world. He has won more than 40 European martial arts competitions, and has worked as a fight choreographer and stuntperson on stage and screen. He teaches combat with rapier, longsword, spear and other historical weaponry in a 6000 sq ft facility, and he leads a team of more than 30 instructors, working with more than 2000 new and repeat students every year. But though his presentation was titled Swordplay and the Lost Art of Knighthood what Devon brought to the TED stage wasn’t a talk about the latest interpretations of Fiore or Capo Ferro – but rather his own thoughts about inspiration, mastery, courage, and the power of physical movement. Mr. Boorman joins host Scott Farrell in a conversation about the challenges of bringing the ideals of chivalry to a TED Conference (who might know little to nothing about the historical practice of swordsmanship, and the code of honor that went along with it) as part of his talk about movement and mastery.